Wow, I was beat last night. The boys were beat. It was a long, quiet night of children sleeping soundly. Because they had a great time at the Children's Museum. I did prepare us well, I wasn’t born yesterday. I know what to do to help the boys feel calm and help them adapt to breaks in our routine. They get a couple of medications in the early afternoons to help them with anxiety and hyperactivity. Yesterday, we had those meds before we left. I didn’t think there was anything wrong with stacking the deck in our favor a bit. We left the house a little early, because I was afraid of missing the class, but we were early enough that we got to wait for awhile in the lobby for the bus with the rest of their class to arrive. They waited really well though because there was a lot going on in that lobby, and one of their favorite pasttimes is people-watching. When the class arrived, AJ got shy immediately and hid behind me. It was actually all three kindergarten classes, so it was a bunch more kids than they are used to seeing. Miss Sherry, one of their EAs (educational assistants) was there to help me follow the boys around and generally help them have a good experience. And then we didn't even see that much of their classmates, because for the most part everyone just ran willy-nilly around the different exhibits and activities. We ushered them in and toward the water-play area and suddenly AJ forgot all about his shyness. Oh, the water! They could have stood back and watched the other kids playing with the boats all day long! And then they spotted the bubble table. This girl was awesome at making giant bubbles and she seemed to enjoy entertaining AJ. She tried to hand him a bubble wand, but he didn't take it. So she just made bubbles with both hands. It was difficult to convince AJ that the lego table wasn't for sitting on, when that other guy was sitting on it. 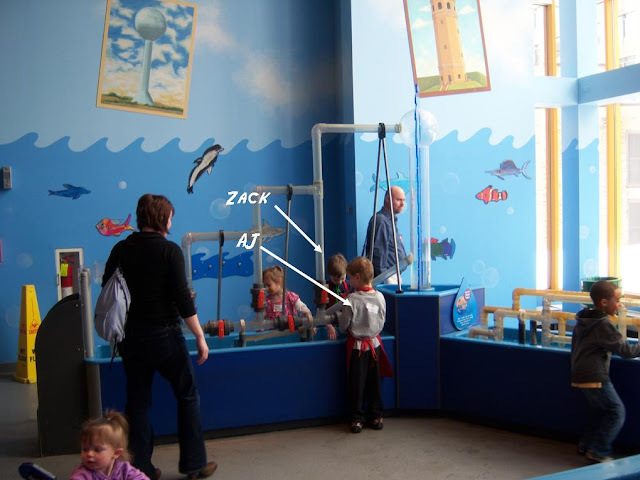 Eventually we had to strong-arm them out of the water area or they wouldn’t have seen anything else in the whole museum. There wasn’t a whole lot more they were interested in, though. We walked them through the Lego castle displays and the Earth room. They did enjoy the slide and tunnel. None of the pictures are very good because I had the pocket camera along, and I was more focused on keeping the two boys in sight than getting the best angle for the shot. Also this camera has a delay of between 7 and 13 seconds every time you push the shutter button, so basically you just aim it in the right direction and then wait and hope for the best. I'm glad we decided to go on the field trip. It was a great experience.